Diamonds are a girls best friend and denim is the perfect way to dress down but still look great and fashionable! A diamonds & denim theme party is a great way to dress up dressing down but in a fashionable way! The cool thing about this party theme is that it uses items that almost everyone has. Everyone has a pair of their favorite jeans and everyone either has bling or can pick up some bling of some kind for the party. This article will cover the main aspects of planning a diamonds and denim party including where you can buy fake diamond jewelry, resources, pictures and ideas for taking a diamond and denim party to the next level! How Do I Throw A Diamonds and Denim Theme Party? First you must define the party for your guests, many aren’t going to know what a “Diamond and Denim” party is right off the bat. Let them know it’s going to be a mix of dressed up glamour with a chic dress down component as well. This means for girls they should wear denim jeans, skirts, dresses and jackets with as much white gem jewelry as possible. A country flair fan be added with cowgirl hats, bandanas and cowboy boots. Guys can go a couple of ways, they can do dark jeans, black jacket and a blinged out chain, diamond watches, or a bracelet. Another take is to go with jean jackets, jeans, or a bit of a cowboy theme as well with bandanas mixed in with their bling. You can also have big blinged out belt buckles with dollar signs to show off the diamond aspect. Tell guests that they are to arrive in their diamonds and denim and to expect a mix of glamour and chic dress down. This will help them prepare and get ready for the event and make sure everyone looks good. The best decorations are the ones that shine or bling. You can go with some stars mixed into the diamond theme because the white sparkle fits in really well. This is a great pack of 50 various party items with a diamond prismatic finish to establish a cool sparkle vibe. Passing out rings at the beginning can be another cool way to get the bling factor into the room. Giveaways are fun because people tend to collect them through the night so by the end of the night a few of your guests will be super blinging through all of the rings and party items they have picked up. This assortment of fake diamond rings is the perfect way to get the sparkle into the party without a ton of money. Buy these fantastic diamond rings for your guests. They come in packages of 12! Spritzers, sprite, and club soda all work well to give a lot of fizz and keep the party hopping all night. Consider using one of these light up martini glasses to take advantage of the bubbles and create little dancing bubbles of light in your guests glasses. Other drinks that work well are either champagne or sparkling apple cider. Both of these drinks work really well and are perfect for adding a bit of glamour and sparkle to the evening. 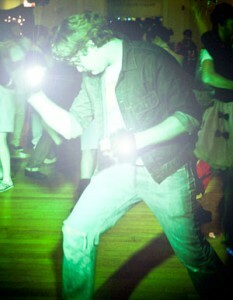 Picking the right kind of lighting can really up the coolness of the party. You can either hire an event lighting company, or you can buy your own lights for the party. After the party you can sell them online and really the only money that you would be out is the money up front for the lighting. Some cool effects are called either a star ball or a moonflower. We’ll look at the moonflower first. These lights use high powered LEDs to project pin beams of light that look like little diamond. It’s somewhat of a mirror ball type effect but much easier to setup and requires less work to get it just right. The cool part of these lights is that the LEDs create little or no heat so you can use them all night and don’t have to worry about guests burning themselves on the lights. You can buy LED moonflower lights here. This star ball light is perfect for creating pin points of diamond shaped lights on the walls at your party. This light is called a star ball light. It uses a high power LED source to project little white beams of light all over the place. These lights are similar to the moonflower but have a wider coverage. This means you can put it on a table or in one spot and it can cover a larger part of the room with just one light. These lights are great effects because it looks like little beams of light and diamonds all over the room. You can buy the star ball effect here. Decorations can be handled a number of ways. The most important is making sure you have lots of silver, white and sparkly items. Centerpieces you can use things with stars in them in the middle of the tables. Strobes around the room can simulate a cool diamond sparkle effect. This can also help keep the energy up so it always looks like people are getting their photo taken. It looks great and helps juice up the energy for the party. These mini-string strobe lights are great for this purpose. A mix of classy loungey music is great for pulling off this party as guests are arriving. This type of music is a great mix of informal and cool chic formal. Here is a great selection of club music through Amazon that would be perfect for this type of party. You can also search for diamond songs that would be a good fit. Diamonds are a girls best friends is a perfect song for a diamonds and denim party. These glasses are great in multiple colors and come in packages of 20 perfect for drinks for your guests. Buy them here. Diamond and denim parties are a lot of fun, using things that people already have you can create party that is chic, glamorous and funky. The glamour of the evening, the fun music, photography, and video can make it an awesome experience for you and your guests. You can throw the party around various purposes, you could have an award show, birthday party, or any other type of event that would warrant diamonds and jeans. Remember, have fun, make it big and be glamorous!